My company bought an UM3 before Christmas, and I have been asked to look after it. Since purchase, I have had an issue using the auto bed levelling. It appears to be using the raise print head lever the wrong way around. Manual calibration works perfectly. When levelling either head, it pushes the head into the bed with such force that it compresses the bed springs fully. it appears it is trying to calibrate the 1st head, using the sensor on the 2nd. Similarly, when the 2nd head is lowered, it tries to calibrate using the sensor in the 1st head. It's almost as if there is a bit set incorrectly in a configuration somewhere. The recent firmware update hasn't made any changes (apart from a new issue with network connectivity, which multiple people are having). I'd really like to get the automatic levelling sorted, as ultimately I am not going to be at my company for too much longer (I'm a placement student). I would need to hand this over to someone, and if they have to manually calibrate every time, this is quickly going to become problematic. How ever if the bed screws are wound right out the bed is very high off of the aluminium plate then the nozzles will contact the glass before the system starts to look at the measurements and it continues to push into the glass. The simple solution, wind the bed down a few turns on all of the bed leveling screws and try again. The nozzles should not be touching the glass when the bed has rapid-ed up, and before the bed is moved slowly up to touch the nozzles. 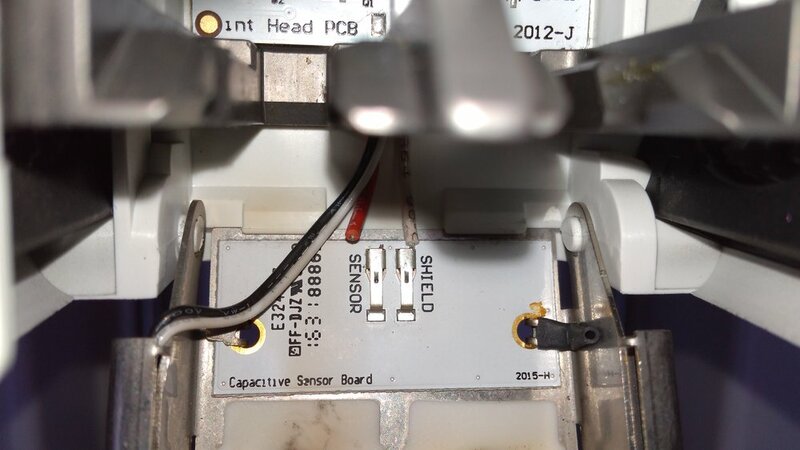 If the issue continues you may have a defective sensor, which I have heard of before. Also check there is no debris on your nozzles or glass bed. Hi, it would help if you could share the log file with us. You can send it to me directly via a direct message and attach it to your message. Was there also an error message on your screen? You can subtract it via: Cura setting: regular fan speed at height. I'm not sure I follow you. How does the "regular fan speed at height" give me the information on bed levelling? The default is set at 0.57mm for "Regular Fan Speed at Height". In terms of error message, I only get an error on the printer, stating that the difference between head height is too large when I do automatic levelling. As far as I am aware, this is on the printer itself, and not in Cura (therefore I have no log to send over). I've manually adjusted the bed today, so that the three screws are tighter, and the bed sits much lower. Automatic levelling ran, and uses the "correct" head for reference. However, once auto levelling had completed, when printing on the bed the head collided with the bed, and failed to print anything at the front or rear of the model, with only the left 1/3 and right 1/3 of the first layer being printed. I thought that this was just an issue with the first layer, but having left it for a while it was clear that it had not referenced the level of the bed correctly. That is weird, I thought I was replying to a different post. Whoops, too many tabs open. My apologies. The log file would still make sense though. Hi! I have the same problem with my UM3, however the active levelling has been working properly for over half a year now. Today a scheduled levelling occurred and the bed started to push the printcore 2 its absolute limits, then the bed lowers down and approach the printcore once again. I had to power off the printer as it was not responding for the abort command. What could be the problem? Can the sensor be damaged? I would really rather not send the printer back to my reseller as I really need it right now. I have attached logs from my UM3. Hi @Tomasz_M, welcome to the forums! Hopefully we'll be able to offer you some help here. Our product experts took a look at your logs and it looks like after 30 seconds your capacitive sensor failed to provide any feedback. After 30 seconds the Ultimaker stops trying. This should not be harmful to your printer. 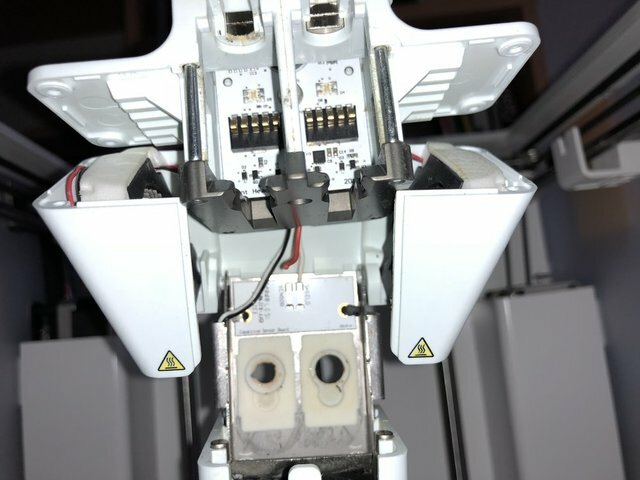 You could check if the wires below are still connected properly or if you see any damage to the wiring (Older Ultimaker 3's may have black wires). Make sure you work ESD safe (ESD= electrostatic discharge) The sensors are sensitive. How do I fix it? 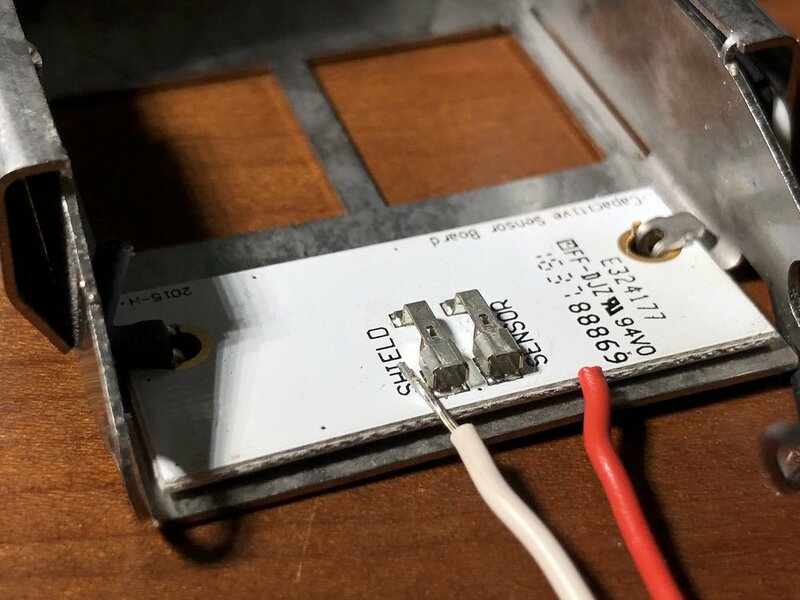 Can I solder it, or the temperature will melt the solder during print? The cable is rather to short for any other fix. Can I disassembly the print head? What about my warranty in that case? Yea, that looks like it won't work. Sorry for the inconvenience! You may be able to solder it or disassemble the print head, although such actions need to be discussed with your reseller first. It is up to them to decide whether the risk is too big and they prefer to do the repairs themselves, or if you can do it yourself with some guidelines. So I would recommend to reach out to your reseller with this photo and ask if you have permission to repair it and/or how to move forward. Can you provide any assembly diagram of the printhead? Repair would be easy however the sensor cable is winded around the sensor connector and it is hard to unwind it. However it is a bit risky to disassembly it without any intructions. Hi @Tomasz_M, those instructions are best retrieved from your reseller to ensure there are no unforeseen problems with hindsight later. I've managed to disassembly the printhead and fix the wire, now levelling works again. You should consider changing the design of this feature in next release, maybe some wire stress relief would help? So because my reseller is Conrad, I gotta repair it myself, like Tomasz_M. Sigh. Hi @leliep, sorry to hear you are facing difficulties with the active leveling. You don't have to fix it yourself, but it can be your choice if you want to. In any case, I would recommend to get in touch with your reseller and discuss with them what the best course of action is in order to fix this. It can be that you prefer to do it yourself, but even then it is smart to mention this to your reseller to avoid any complications further down the road. If you prefer an official repair, you should be able to get this as well. Conrad should be able to provide the instructions for you, or you could try contacting iGo3D as they are our sales partner in your region. Getting the instructions from them means they agree with your repair and there are no unwanted surprises or miscommunications further down the line. Thank you for understanding! 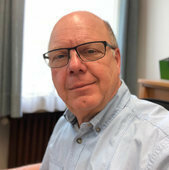 Thank you, SanderG, for your kind recommendation, I respect your opinion. Anyway I just repaired it, my UM3 ist printing again. Wasn't so difficult, please see my photos and the description. Both of the wires connecting the capacitive leveling sensor are plugged into contact springs on the sensor, and the other side is plugged into a print head PCB connector. 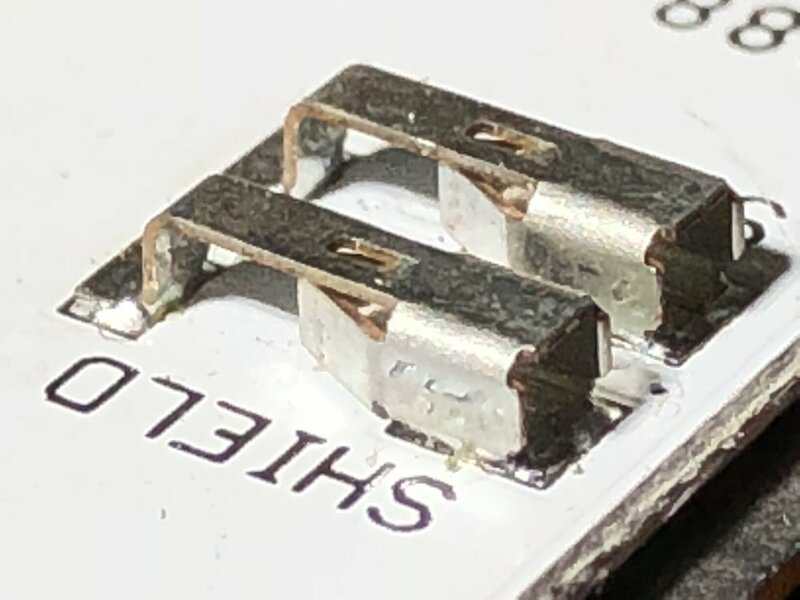 Obviously there is a design problem which leads over time to breaking wires at the sensor side, due to bending the wires when opening the print core cover for changing the print cores. 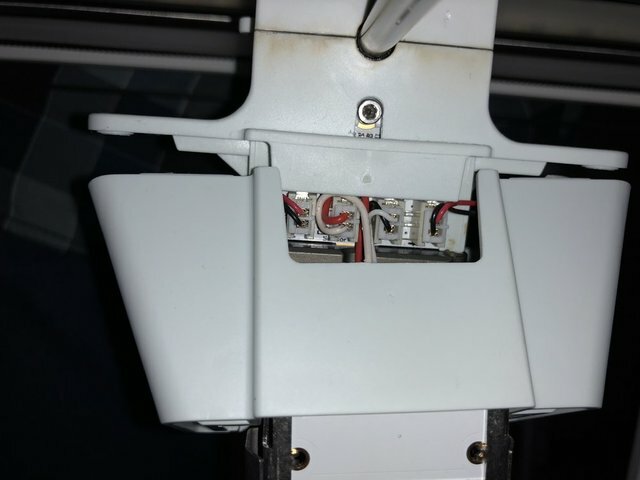 If you want to repair the broken leveling sensor wires, you got to unscrew the four screws holding the bottom part of the print head. The bottom part then is only held by the level sensor cable and the front fan cable (the two middle connectors of the four ones). Disconnect both of them, be careful to not damage the wires while freeing them. 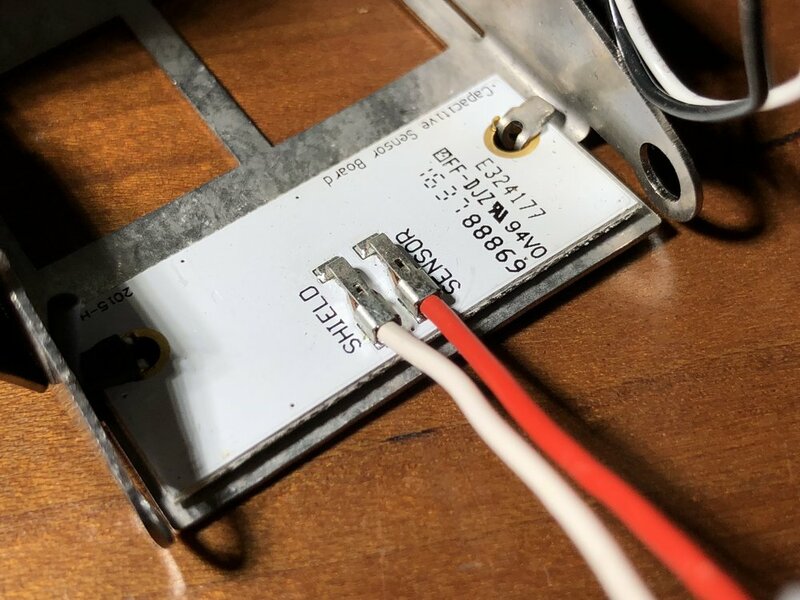 Now that you have the printhead bottom part separated from the printhead, you can disconnect the wires (or remove the broken part of the wires) from the contact springs by carefully opening the inner part of the spring until the wire can be pulled out. Don't use too much force, the contact spring is very delicate! If you bent it away from the middle you gotta bend it back. You might wish to use a magnifier and a pointed tool like a needle for this part of the action. Un-isolate the ends of the wires and solder them, then plug them back into the contact springs, take care not to reverse them (see pictures). Check that they are tightly stuck in there, otherwise you need to bend the spring somewhat more. After re-assembly of the printhead (careful with the side fans and their cables) and inserting one or both of the print cores you can start the auto-leveling procedure and hopefully start printing again. Thanks @leliep for your instructions. Those made it quite easy to fix it myself. I didn't put the wires back around the connectors (as in the 2nd picture of leliep) because that made the wires very tight. @leliep thanks for your notes. I have the exact some problem and I'll follow your notes to fix it. Hello, we are experiencing a very similar problem with our Ultimaker3: The printer can not complete the auto-levelling since the Z axis leveling fails, the build plate goes on increasing the height and compressing the nozzles of the print core, never ending the process. 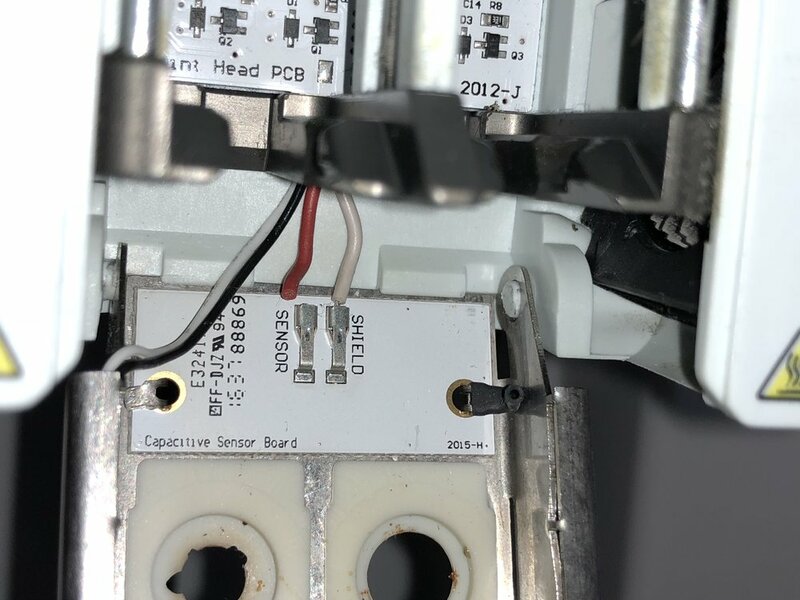 In the forum discussion we have read that many other users experienced this problem, and the rationale could be the capacity sensor broken or not working properly. 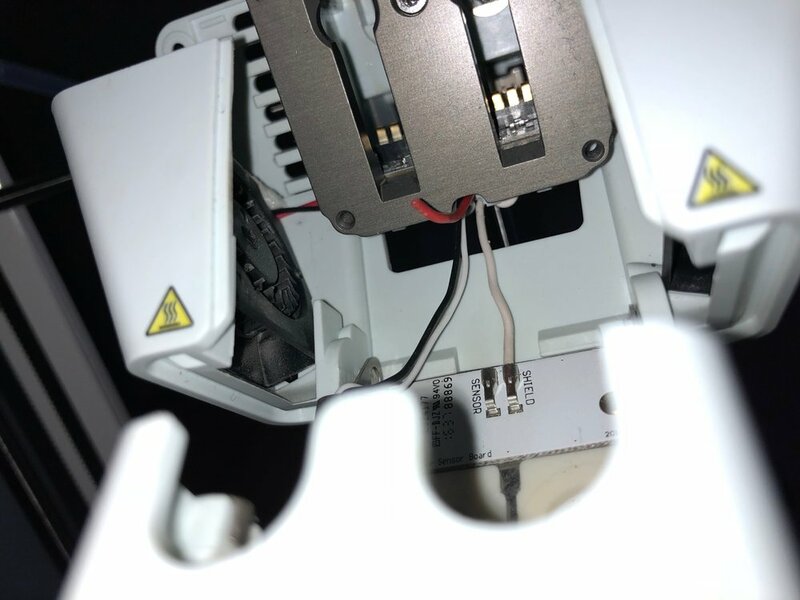 Before dismounting the printer head to check the capacity sensor connections (from the visible portion it seems that everything is ok), I would like you to check the log files that I have attached in order to get the confirmation that the problem is actually the capacity sensor. Could you check the log files please? I replaced the cap board and cables to no avail. When i go to calibrate XY, it says ER45 and a link to ultimaker. -Checking the link shows a broken page. The nozels are 10mm away from the bed despite being correct when i manually adjust the bed. I got the same issue right after the firmware update. I changed the cap board but cant active level. However if i go to print a part it works, and just starts printing. Can you roll back a firmware update? USB updates are temporarily not supported.